The project enabled to build a system for energy efficient street lighting in nine villages in the Municipality of Kainardja in order to achieve savings on electricity expenditure and costly maintenance of the current lighting system. The municipality of Kainardja, in the Silistra region, has the lowest development rate in the region and is considered a backward rural area. Among the problems the municipality faces is the low degree of development of infrastructure, insufficient public services, such as transport; low level of education and general lack of qualification of the population combined with high unemployment, limited opportunities for employment, and an average low income per capita. In order to improve public services, the municipality decided to apply for funding under measure 322. The main objective of the project was to improve public services in the municipality, in particular in 9 of the villages within in the municipality, through the creation of a new lighting system, using alternative sources of energy. The main activity undertaken during the project was the creation of a street lighting system, in particular building and installing 486 lighting fixtures, and installing solar panels and rechargeable batteries for each of them. 486 lighting fixtures functioning with solar power were installed. 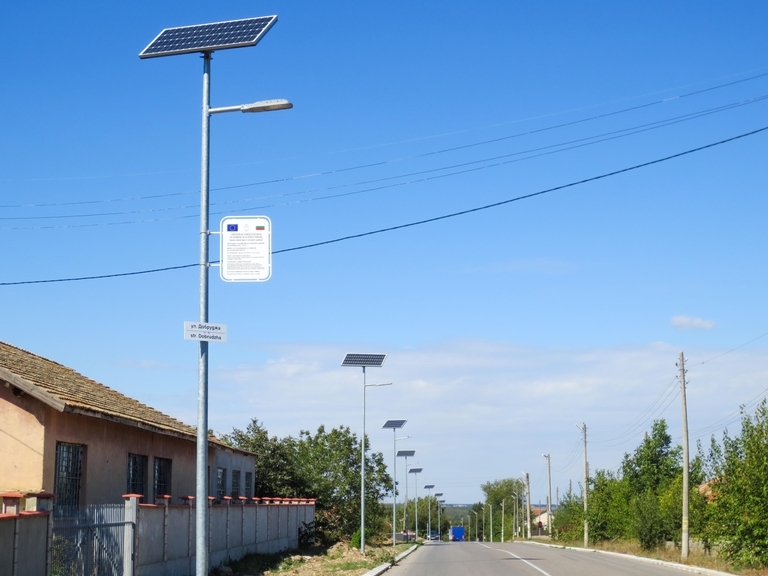 The new solar lighting system enhances the quality of life in the Municipality of Kainardja. The use of solar energy will also generate savings on future expenses for electricity and maintenance of the lighting system. Formulating and implementing useful and innovative ideas, and planning the project implementation - including the financial aspects - thoroughly, are the main prerequisites for the success of a project proposal, combined with consistent efforts of the project promoters. The project was implemented in Municipality of Kainardja located in North-East Bulgaria on the border with Romania.